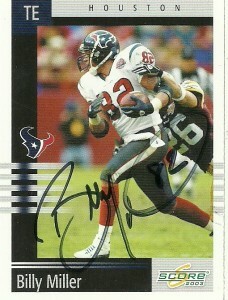 Billy Miller is best remembered by Texans fans for scoring the franchise’s first TD against the Dallas Cowboys in 2002. His reaching grab on the opening drive of the game, (an eventual 19-10 victory) served notice of Miller’s determination to be accepted as a football player on the pro stage. It also was the first touchdown scored at Houston’s Reliant Stadium. Miller was originally drafted by the Denver Broncos as a wide receiver out of USC in 1999. The 7th round choice did not see any playing time through 2001, and was so upset about being cut that season by the Broncos that he used his ‘turk buckslip’ as motivation, taping it to the inside of his locker. Basically adopting a “Will do anything mentality”, Miller arrived in Houston before the team took the field its inaugural season, not even really registering a blip on the free agent signee radar. Shifting to TE, Billy supplanted Rod Rutledge in the lineup and quickly developed a rapport with quarterback David Carr as his safety valve. With his soft hands and speed, he provided a mismatch against nearly all opposing linebackers and defensive linemen that might shift into coverage to stop him, forcing most teams to deploy a DB in coverage when he released out into the flat. Billy became the team’s first receptions leader, finishing the 2002 season with 51 catches (for 613 yards and 3 TDs), in 7 starts. In 2003, he added another 40 receptions to his team leading total, but already with the emergence of Andre Johnson by 2004, Miller’s reception accomplishment has been rendered to an interesting footnote. An injury riddled 2004 limited Billy to 17 receptions and a touchdown. 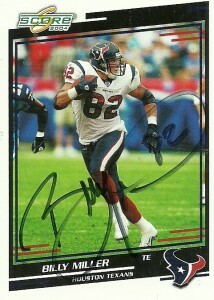 He’d score that final touchdown with the Texans, in a 31-21 rout of the Tennessee Titans, as the franchise finished 7-9. 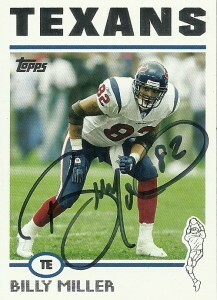 The Texans in 2005 decided they were ready for primetime football with the big boys, after their impressive 2004 season. To further this theory they decided to purge their roster of many of their expansion draft players. Billy in the meantime signed with the Cleveland Browns, suiting up for only 3 games but getting no play time. In 2006 he’d join the roster of the New Orleans Saints and his statistics saw a slow but strong rebound. Over the next 3 seasons, he’d record 86 receptions for 1036 yards and 3 touchdowns. Resigning with the team in 2009, Miller blew out his Achilles in training camp. While he’d win a Super Bowl ring for the Saints victory over the Indianapolis Colts, Billy decided that it was fine time to retire. Miller currently runs Elite Performance Factory, a strength and conditioning facility gym in California. In 2013, Miller was named the strength and conditioning coach of the Tampa Bay Buccaneers.